Espruino IDE on Windows 10? I've tried to convert him to using his mac, but he prefers his Windows setup. As you are asking for your friend, [or is this quote friend un-quote supposedly a Win10 person ;-) ] I'll assist for your friend of course. . . . Surprised there are issues, as it's really not that complex. Install the native app. Pair the device using Windows. Launch the IDE. Start writing code.
. . . .that said . . . . I had a bit of a struggle with my two year old HP laptop that was supposed to be BT compatible. But in order to continue (for a Puck though), I eventually had to pick up a Bluetooth BLE dongle to make Windows happy. After that it just worked! @Gordon, do you recall the link to the BLE dongle referenced above? Please post at what point your 'friend' ( wink, wink ) is having difficulty, and I'm sure there will be plenty of help to assist. Also, please indicate for, using @Gordon notation, where in the documentation flow, things became conflicting as you put it, so that fixes may be considered. and . . . I'll be trying this over the weekend, but recommend the native app as reliable. Web Bluetooth in Chrome for Windows! The 'documentation' inconsistencies aren't that per-se, but more that when you google in frustration "Windows 10 espruino IDE" you'll find references to it not working, working, Chrome plugin working with Canary, and other vestigial anecdotal info. Could it be that this dongle just isn't up to snuff? On Pico WebIDE Connect - Unable to retrieve board information. Connection Error? I realize my issues were for the Pico, but my initial observation is that we may have parallel issues. The IDE/Win10 similarity. If so, are you able to add anything that I may have missed? also, . . . would you please try a re-edit (lower right corner of your post) of the @Robin and @Gordon reference, maybe drop the ';' to see if the forum post mechanism then highlights in blue. Hope there isn't an issue with that forum feature. but I just plugged the dongle in and Windows took care of the rest. It just worked! One of those is a plugable one. 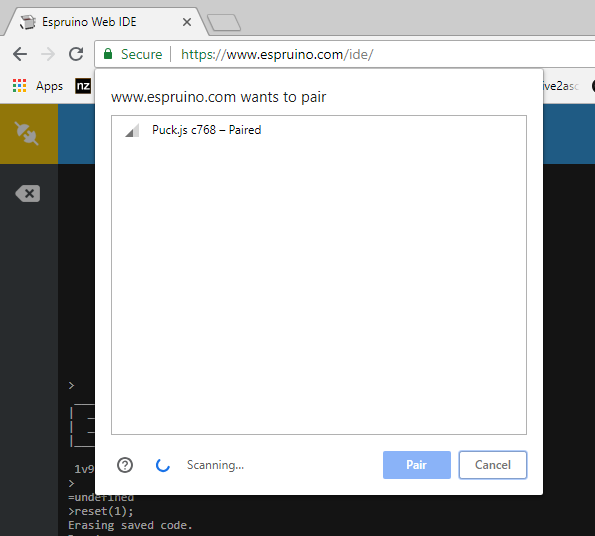 Chrome Canary works great with espruino.com/ide on Windows 10 now (But you don't want to pair Espruino first!). In a month or two when Chrome 70 hits the 'normal' release it should work as-is as well. Maybe you or your friend could post up the Web IDE's console log (in settings) as it might shed some light on why it's not finding anything. Thanks @Gordon and @Robin for the follow up. I'm a bit stumped right now, but will forward the email trail on to him and try to stop by in the next few days to help him out. He also has another Windows machine I'm going to ask him to try; I'm beginning to think there's something funny about his Windows 10 installation or updates. Yay - been waiting since pucks came out for this!